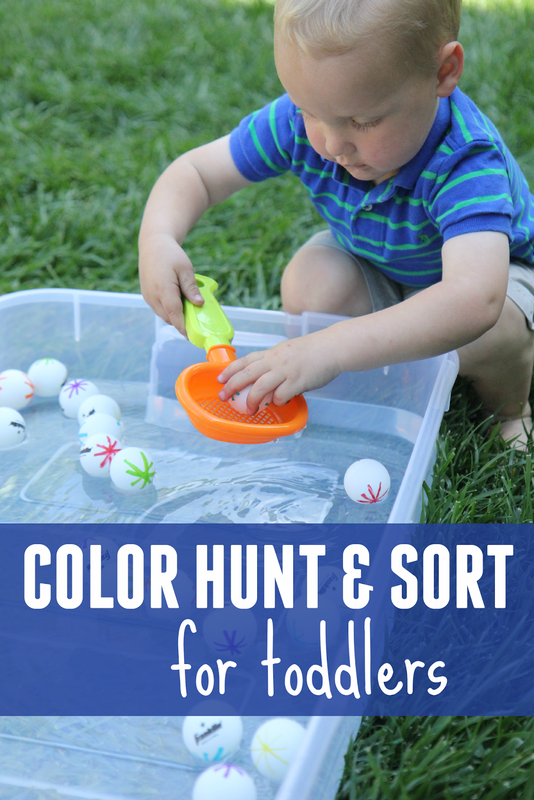 Today for Day 3 of our "A Very Toddler Summer" series I am sharing a cool color hunt and sort activity for toddlers!! If you missed yesterday's DIY treasure chest for toddlers activity, head on over to I Can Teach My Child. You can find all of the posts from our "A Very Toddler Summer" series here. If you're just joining in our "A Very Toddler Summer" here are a few details about it! 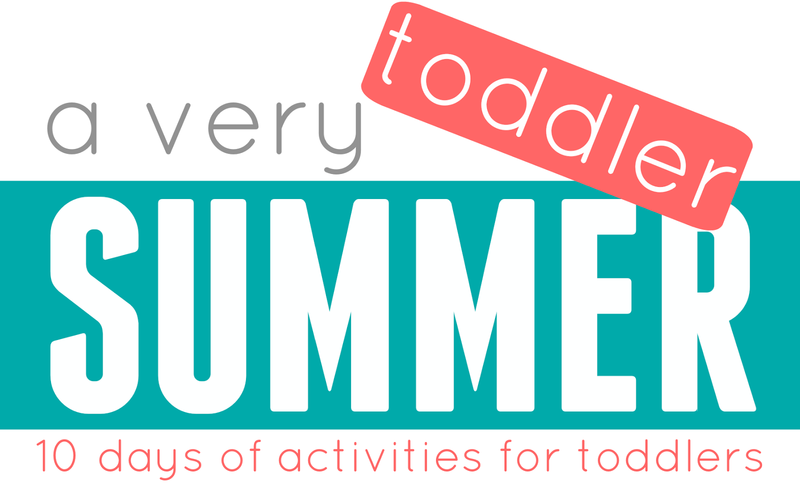 Our "A Very Toddler Summer series" is a 10 day series full of simple activities for toddlers! On Mondays and Wednesdays I'll share activity ideas targeted for 2-3 year olds and on Tuesdays and Thursdays Jenae will share activity ideas more for 1-2 year olds. On Fridays we'll share several other favorite summer activity ideas for toddlers that we've found around the web! My toddler loves water and balls. I thought it would be fun to put those two things together to make a totally awesome toddler activity. Make sure you prepare yourself for a WET toddler and some splashing! My toddler has been loving learning about colors lately too so we tied that into this activity. Once you have your materials you'll want to prep a few things ahead of time! First start by drawing on your ping pong balls with Sharpies. I put a colorful star on each ball so that I had five balls in each color. Next you want to fill up your tub of water just an inch or two and then you want to grab a net or scooper. Now you are ready to get started!! **Just a reminder... all activities shared on this page require adult supervision. Please don't leave your toddler alone with a tub of water! To begin the activity just let your little one explore and play! Notice and comment on the color balls your child picks up but other than that, just let him have fun. 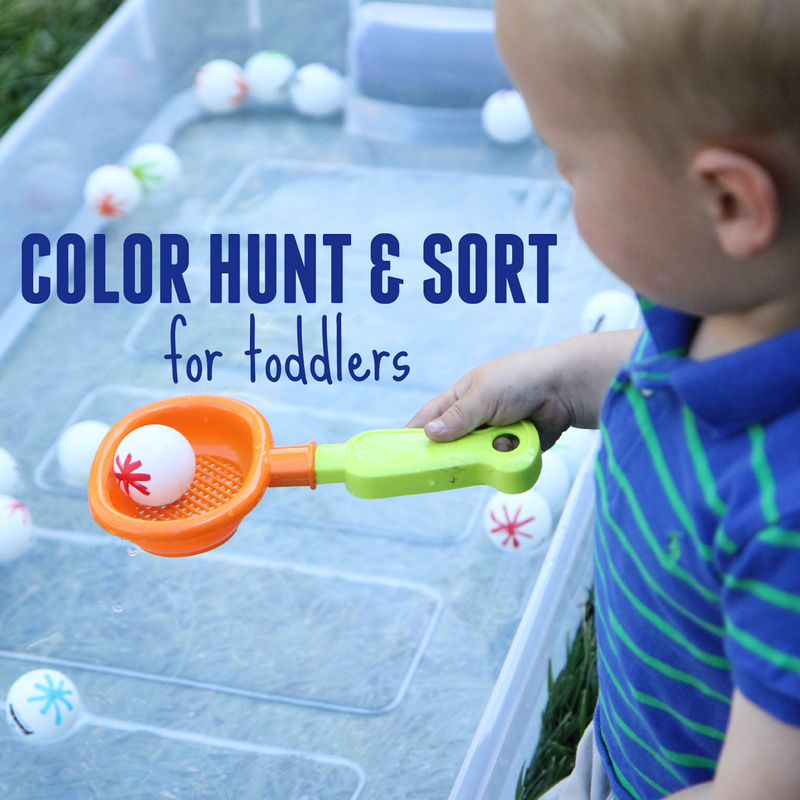 You can set up colorful bowls around the water tub and see if your child wants to try and pick up the balls and then place them in a similarly colored bowl that matches the ball they pick up. Some kids may just have fun picking up the balls and dumping them back in again and again. My toddler loved this activity SO MUCH that when my big kiddos started trying to join in he had a giant tantrum that included throwing things and screaming. Good times! It was cute to see how much he liked the activity, though I would've loved him to express his anger at his siblings in a different way! While he had a little tantrum indoors, the big kids took over this activity and my preschooler really got into sorting and arranging the balls by colors. If you have a younger toddler, just skip any sorting and encourage your toddler to scoop and play in the water. If your toddler likes to transfer things, put a small bowl or an additional empty tub nearby so that your toddler can transfer the balls from one place to another. Feel free to mention color words while you talk to your child as they play in the water. You can also talk about direction words (up, down, over, under, etc.) as your child moves the balls around. Have you done any other activities using ping pong balls or any fun water activities you've tried with your toddler? Don’t forget to follow both Toddler Approved and I Can Teach My Child on Facebook and on Instagram. I am @kristinatoddlerapproved and Jenae is @jenaeteach.